Two, possibly three, events occurred that piqued the interests of healthy women about egg freezing. First, the process was no longer considered experimental by the American Society of Reproductive Medicine (October 2012). Secondly, the pregnancy rates using frozen eggs improved considerably, and lastly Facebook and Apple announced they would cover up to $20,000 in costs for the procedures involved in egg freezing for employees. Egg freezing in medical terminology is called oocyte cryopreservation or vitrification. The process involves stimulating the woman’s ovaries with gonadotropins (injectable hormones over approximately nine days) that produce multiple eggs, as in standard in vitro fertilization (IVF). Next, an egg freeze patient’s eggs are retrieved surgically after conscious sedation. At Carolina Conceptions, we do this procedure right in our office. An egg harvest does NOT damage the patient’s ovaries. Following the retrieval, the eggs are immediately frozen by Dr. 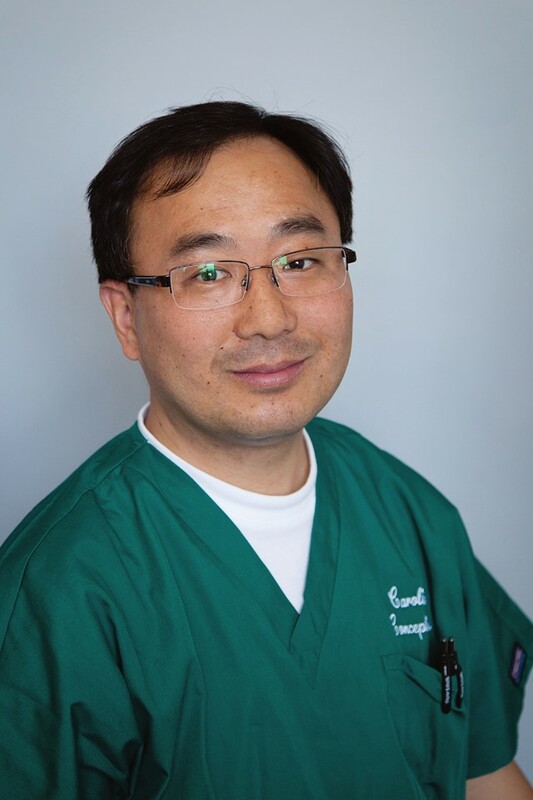 Sung Tae Kim, our head embryologist. Egg freezing is an intricate process, much more so than embryo freezing (fertilized egg freezing), which is a common procedure in most IVF centers. The size of the egg makes it one of the largest cells in the body, and freezing it without causing ice crystal damage of DNA, is of paramount importance for eventual thawing success and live born pregnancy success rates. Dr. Kim has completed an arduous training program implemented by DEB, the Donor Egg Bank of Washington D.C., that permits Carolina Conceptions to freeze and thaw donor eggs in conjunction with this nationally recognized egg bank. Eggs are frozen and stored for later insemination with sperm from a future significant other or a donor. The average age of egg freezing for social reasons in the US is 37 to 39. As you can see in the chart below, the live birth success rates for a 38-year-old egg freeze patient are approximately half that of a 25-year-old egg freeze patient. The most common reason for egg freezing is that the woman is not currently in a relationship conducive to childbearing, followed next by obligations of her profession. However, this is changing. Most recently, younger women are freezing their eggs due to professional obligations. Women may be so immersed in their well-paying careers that is seems quite prudent to spend ten to twenty thousand dollars to undergo one to several cycles of egg freezing in order to bank up to the twenty eggs needed to optimize their chances of live birth later in life. Women who have been diagnosed with cancer and have a great prognosis for recovery, are also encouraged to freeze their eggs prior to beginning their chemotherapy and radiation treatments because eggs will be damaged for future use in this process. According to ASRM (American Society of Reproductive Medicine), the chance that a single egg will lead to a live birth is about 2 to 12%. Success is based on many factors including a woman’s age and her egg count. Egg count can be determined by obtaining a random blood sample for an AMH level, or antimullerian hormone determination. Success is also dependent on the proficiency of the IVF facility freezing her eggs. When to freeze eggs is a matter of opinion. The optimal age is probably before 34, but successful freeze thaw live births do occur, albeit at lower rates, in women of more advanced ages. Egg freezing can be done by many fertility clinics, but not all of them are validated by egg thawing and success results. Carolina Conceptions is validated in egg stimulation, freezing, and thawing by Donor Egg Bank. Many more women are choosing to consider this process to extend and preserve their fertility for a later date when they are ready for children. Find out if egg freezing sounds right for you and learn more about what to expect in an egg freeze cycle at Carolina Conceptions. If you are thinking seriously about freezing your eggs, please schedule a consult with one of our four double board certified physicians to review your options. Carolina Conceptions is offering a patient discount on egg freeze cycles in January and February 2017.